In my quest to photograph more lighthouses, we got off the Florida tollway and headed north on Hwy 95. I was told there were two lighthouses I needed to see on my way north, one at Ponce de Leon Inlet and the second at St. Augustine. Ponce de Leon Inlet is a bit out of the way, but well worth the side trip. You cross the Halifax River to go over to the penisula and the lighthouse is about 6 miles south on the tip of the penisula. You get your first glimpse of the lighthouse when you cross the Halifax River. It is a pretty drive down the penisula, mostly houses and condos along the beach until you come to the lighthouse area. I was excited when we got to the lighthouse. It was a very tall, stately lighthouse that was very well preserved. In this lens I will highlight some of my photos and give you information on Ponce Inlet and the lighthouse. 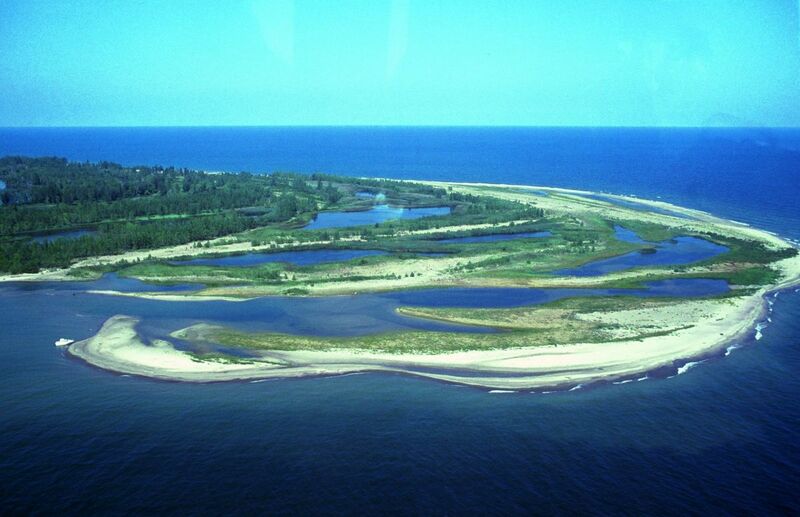 The area that is now Ponce de Leon inlet was first explored in 1513 by Ponce de Leon. In 1803 another Ponce, Antonio Pons, was granted 175 acres in the area where he farmed for 20 years. The research I did showed that the area was originally called Los Mosquitoes or Mosquito Inlet by the Spanish that lived there. In 1928 this name was changed to Ponce de Leon Inlet. 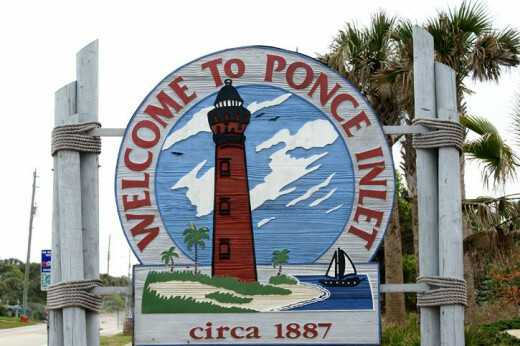 The town of Ponce Inlet resides in Volusia County and it was incorporated in 1963. The town is located at the very southern tip of the penisula, south of the Daytona Beach, Florida area. The lighthouse seems to be the main attraction in the town. When visiting the lighthouse we found the area around the lighthouse to have several restaurants on the water, a nice park, and an amusement area with several touristy type shops. There were several marinas in the area too, and I'm told it is a prime fishing spot. The total population in the town is just over 3200 according to a census taken in 2007. The Chamber of Commerce site says that residents enjoy the area for the relaxed lifestyle and the natural uncrowded beaches. I always like to bring home a small memento of the lighthouse. Sometimes it is a small replica of a lighthouse but other times it may just be a magnet or a charm. 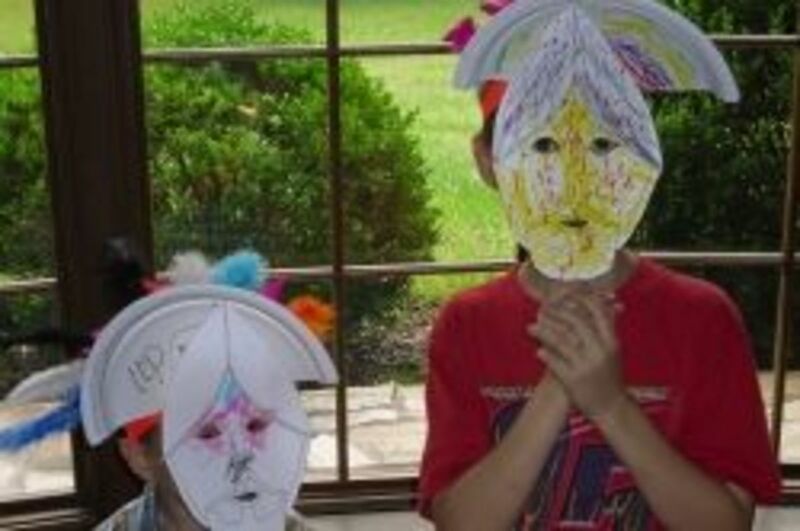 Here are some that I thought would be good. Hampton Nautical Ponce De Leon Lighthouse Decoration, 7"
This beautiful suncatcher would add to a lighthouse themed decor. 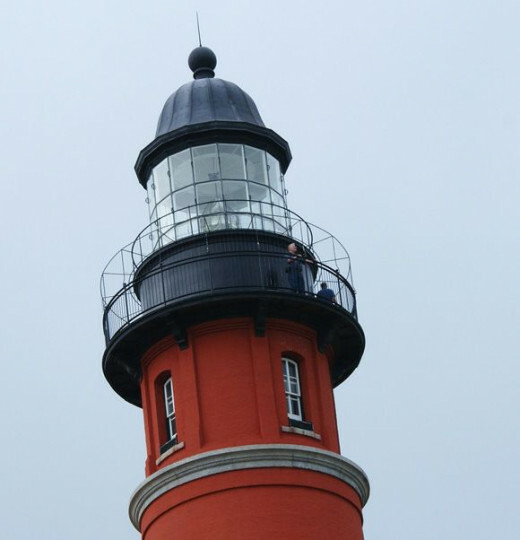 Climb 203 steps to the top of Florida's Tallest Lighthouse. It was a dreary day, weatherwise, when we visited the lighthouse, but I was fortunate that the rain stopped long enough for me to capture some photos. 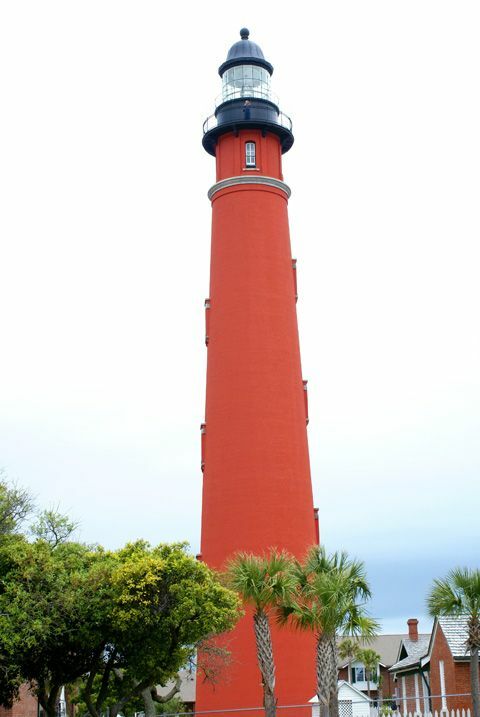 The lighthouse is the tallest in Florida and the height makes it hard to photograph when you are up close. The area around the lighthouse is built up with homes so it was hard to get a great photo. I would like to have been out to sea in a boat. i think that might be the best vantage point for a clear photo. It is 175 feet to the top of the lighthouse and visitors can climb the 203 steps to get a good view of the Florida coastline. Ponce de Leon lighthouse is also one of the few lighthouses in the US with the original keepers dwelling still intact. These links give a host of information on Ponce de Leon lighthouse and the inlet where it is located. Discover the history of the area, other attractions on the inlet and shop at the lighthouse store. Visit the lighthouse store for a wide variety of lighthouse gifts. 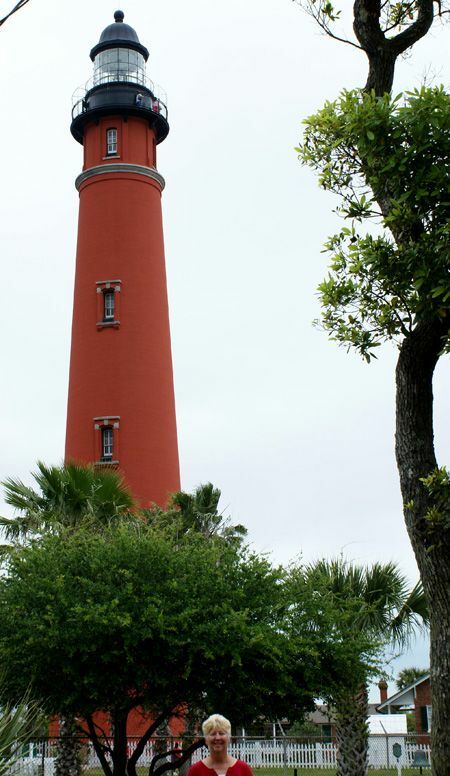 The Ponce Inlet Lighthouse is the tallest lighthouse in Florida. 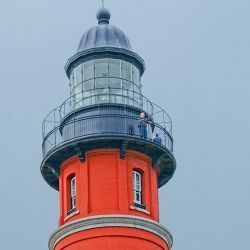 Located 10 miles south of Daytona Beach, the lighthouse and surrounding light station buildings have been completely restored and are now open to the public year-round. Â Â Â It is said that in 1513 (almost 100 years prior to the failed Jamestown experiment), Juan Ponce DeLeon was exploring the land and waters around the inlet that today bears his name. The lens house has a third order fresnel lens that is in operation today. The lighthouse first went into operation on November 1st of 1887. In 1975 the lighthouse was made open to the public. The lighthouse and the museum are now open daily to the public. My friend decided I should be in at least one of the photos. This photo was taken towards the front of the lighthouse. It is a good view with the windows visible. You can look out the windows as you make the climb to the top. I have climbed the stairs on this lighthouse as I used to live pretty close to it. It has a wonderful view of the river and the open water. It has a wonderful history behind it. beautiful photos of poncedeleon lighthouse. 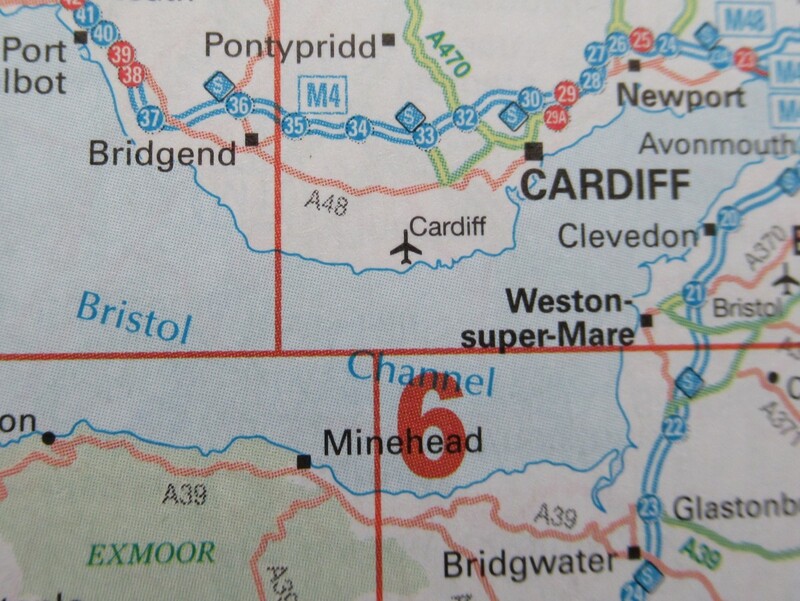 This is now on my list to visit. Thanks, beautiful presentation. Beautiful photographs of this elegant lighthouse in the Daytona area of Florida. 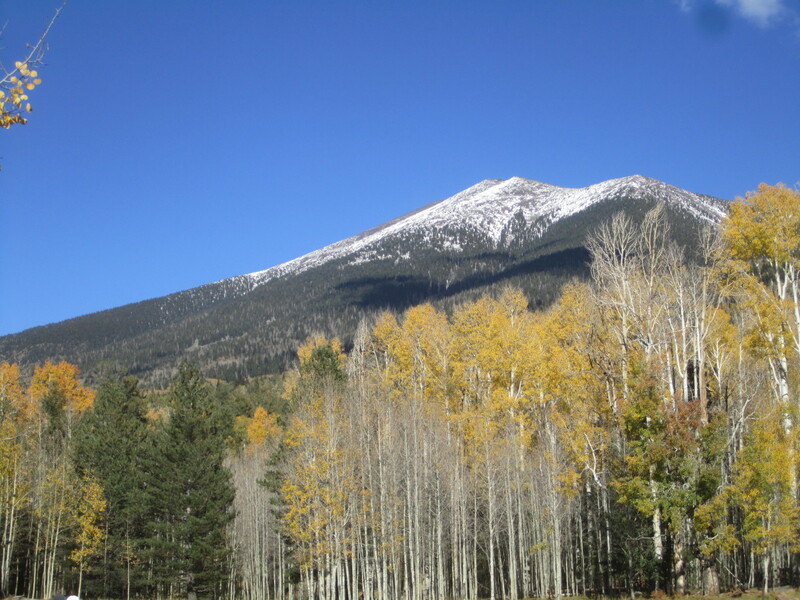 Thank you for sharing your beautiful views with us! I really like your page. I'm the director at St. Augustine Lighthouse. 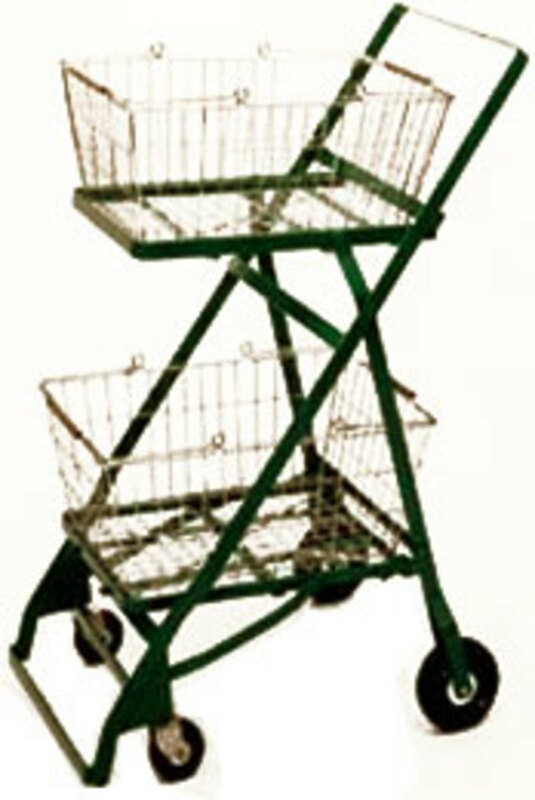 Do you know I remember seeing this one on our High School Senior Class Trip in 1966. It really left an impression on me as does this lens. Great work. I just love the photography in your lenses. You do such a wonderful job! I love lighthouses also! But, haven't visited nearly as many as you! We usually vacation at Cape Hattaras, NC and visit that famous lighthouse and the Bodie Island lighthouse.